Eerder verschenen in Nieuw Archief voor Wiskunde, september 2011, pp. 188–189. Originally from Portugal, Ricardo Reis da Silva came to Utrecht to do his master studies. He then continued as a Ph.D. student at the Universiteit van Amsterdam. Despite the natural ups and downs, he has enjoyed his time in the Netherlands. “The country has a good research and academic environment and I was fortunate enough to work alongside some of the top researchers in my area.” He felt very welcome, both at the Mathematics Department in Utrecht as an international student as well as at the Korteweg-de Vries Institute in Amsterdam as a Ph.D. candidate. But more important than the particular place or the particular work he did, was the global experience of living abroad. That was surely not what he had expected when he first moved here. It was, however, precisely the fact that he encountered so many unexpected things, that made the whole experience so valuable. On June 10th, Reis da Silva successfully defended his Ph. 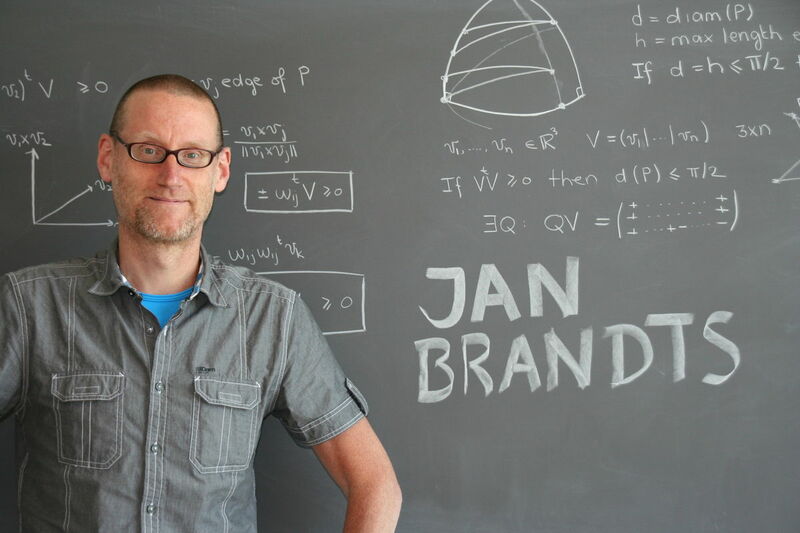 D. thesis Matrix Perturbations, bounding and computing eigenvalues, written under guidance of dr. Jan Brandts and prof. dr. 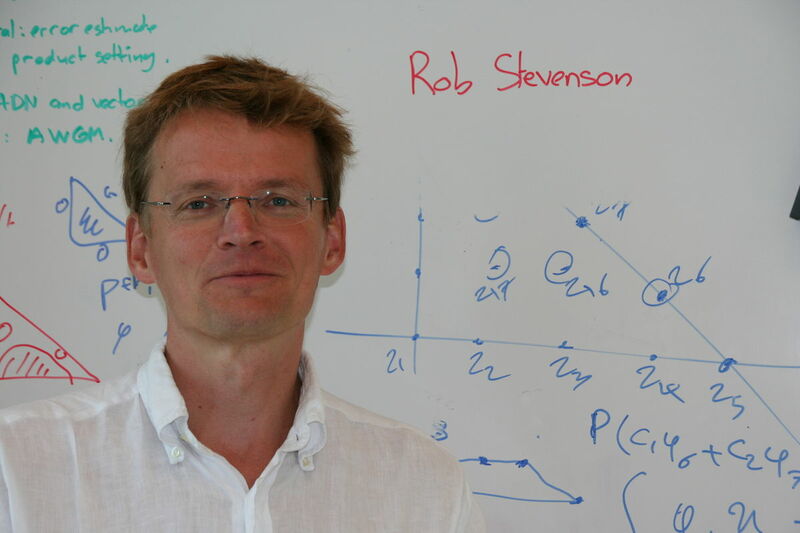 Rob Stevenson at the Universiteit van Amsterdam. His thesis belongs to the areas of Linear Algebra and Numerical Linear Algebra and its contents are divided into two parts covering two distinct though related topics. The first part is on matrix and eigenvalue perturbation theory. In this part he studies amongst others Hermitian rank-k perturbations of Hermitian matrices and their eigenvalues. The study of such matrices and perturbations has a background in numerical methods for partial differential equations. For instance, the Finite Difference discretisation of certain reaction-diffusions differential equations yields a standard positive definite Hermitian tridiagonal matrix resulting from the diffusion part. This discretisation can also yield a rank-k Hermitian matrix resulting from the reaction part, which can be seen as a perturbation of the diffusion Hermitian matrix. 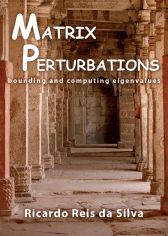 The study of matrix perturbations is, however, also relevant for the analysis of iterative methods for eigenvalue problems. For Hermitian perturbations of Hermitian matrices much is known about the relative position of the eigenvalues after perturbation. The results follow from the variational characterisation of the eigenvalues given by the Courant-Fischer theorem, from Weyl's inequalities bounding the eigenvalues of the resulting matrix by those of the original and the perturbation matrices, and to some extent also from the Cauchy Interlace Theorem on the interlacing property between the eigenvalues of a matrix and of its n−1 principal submatrix. These are all well know and useful results for Hermitian matrices. For Hermitian rank-k perturbations of Hermitian matrices, Reis da Silva developed Weyl-type bounds for the eigenvalues, that are tighter than Weyl's classical bounds while the additional computational costs are very modest. He then used the same technique to obtain bounds for the eigenvalues of arrowhead matrices (square matrix whose entries are all zero except for the diagonal and the first row and column) and for the singular values of perturbed rectangular matrices. For normal matrices much less is known than for Hermitian matrices. For example, given two normal matrices A and E, it is still not fully understood under which conditions A+E is also normal. In chapter 3 of his thesis, Reis da Silva makes inroads in that direction. He studies normality preserving perturbations and augmentations of normal matrices and their consequences to the eigenvalues. Ikramov and Elsner had studied normality preserving augmentations (adding additional rows and columns) of normal matrices before, but nothing was known about their impact on the eigenvalues. In Reis da Silva's thesis it is shown how the eigenvalues of the original matrix are influenced by the augmentation, and moreover, bounds for them are found. Next, normality preserving normal perturbations are studied. For 2×2 and for rank-one matrices, the analysis is now complete. For higher rank, all essentially Hermitian (normal matrices with collinear eigenvalues) normality preserving perturbations are described. And finally, using the stratification of normal matrices presented by Huhtanen in 2001, Reis da Silva constructed all augmentations that result in normal matrices with eigenvalues on a quadratic curve in the complex plane. In his opinion, these results on perturbations of normal matrices are his most interesting results. They appear to resemble those we known for Hermitian matrices and will hopefully motivate others to look more closely into perturbations of normal matrices. 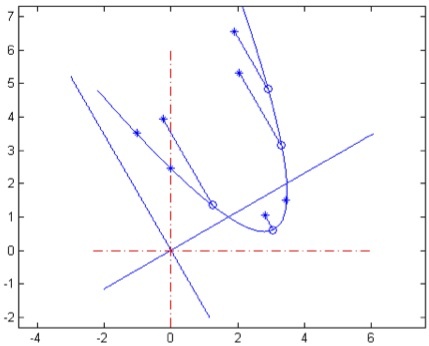 Illustration of the augmentation of a normal matrix A with three of the seven eigenvalues (indicated by the stars) on the quadratic curve C onto a normal matrix with all eigenvalues in C.
Part two of the thesis focusses on iterative methods for eigenvalue problems and, in particular, on the analysis of a somewhat unknown method, the Subspace Projected Approximate Matrix method. This method was developed by chemists and is a relatively recent (2001) iterative method for eigenvalue problems. The introduction of the method and the first results of numerical experiments for chemical applications were promising. However, the method had not yet been analysed from a Numerical Linear Algebra point of view and it was mostly tested in comparison with Davidson's method. It was, thus, unclear whether it could serve as an alternative to well-known methods like Jacobi-Davidson or Lanczos. In Reis da Silva's thesis it is shown that despite some interesting characteristics it cannot. Another result is, that for certain choices of the preconditioner SPAM is mathematically equivalent to Lanczos method. Reis da Silva enjoyed being a Ph.D. candidate. He especially found the combination of learning and being responsible for his own learning process valuable. He also welcomed the additional responsibilities such as teaching. There were several ups and downs during his Ph.D. time. The hardest period was when he was about halfway his four years. He suddenly realised that the time ahead was shorter than the time already spent on the research, while his actual results were not half of what would be needed in the end. Other Ph.D. candidates had shared similar experiences with him, but it was still quite a shock to actually go through this period. The climax of his time at the UvA was indeed to have sent the manuscript to the printer. Just after his thesis defence, he had not yet in mind what would be the next step in his career. But for a while at least he wants to take some distance from doing research and try something different. And after almost six years in the Netherlands he also thinks it is time to move to another (hopefully warmer) location.